What a year 2018 will be with the infinity symbol prominently reminding us of our powerful connection to the universe. Whatever we choose to offer the world, we shall dually receive the abundant benefits. While New Year’s resolutions are a hot topic in the month of January, they quickly dwindle, allowing us to mindlessly slip back into old habits. I do appreciate the opportunity of a new year, which sparks reflection of where I have been, and allows me to dream about what could be ahead. That’s the practical magic part—knowing that through my intuition, I have the power to make those dreams come true. I have spent the last few Januarys creating what some call an Intention Map, and others call a Vision Board. I now call it a Bloom Board, as it has blossomed into an imperative process for how I continue to evolve, and choose to move forward. Last year, I took the once simple process of cutting and collaging images from magazines for those boards and amplified it to include an introspective visualization, along with follow-up. Creating the board is an eye-opening process in itself; however, with a little pre and post attention that I have named “Intention-making and “Action-taking”, the Board is more likely aligned with my authentic goals and, thus, come to fruition. An activity which was fun to teach to groups of both adults and children. Until I have a podcast to be able to share the full scope of the process, I invite you to simply flip through a variety of magazines and tear out any picture, word, letter, number or symbol that sparks interest. Once you feel complete, peruse the images again and decide which ones most resonate with you; for instance, you may feel a visceral response within your body—perhaps your intuitive guidance—so pay attention inside as well as out. Arrange them on a piece of paper or cardboard, then glue them down to solidify your vision for the year ahead! My Bloom Board feels so exciting, for it shows what I am most interested in, and what I intend to move toward. The top portion mostly highlights my plan to focus on growing my Bloom with Bliss business, which may include more group and individual sessions. 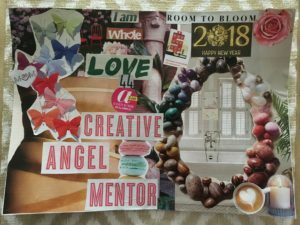 Ironically, I had cut out 3 words, which lined themselves up to say “Creative Angel Mentor”, which I believe describes part of what I do, quite well! Perhaps it will be my future job title. Shown on the bottom right as a tub, cup & candle is my commitment to ensure better self care, as I support others in their quests. My main role as a mom, feels as though I am releasing beautiful butterflies out into the world! And finally, the background contains a few, somewhat hidden images: 2 red chairs, a column and a woman’s midsection. The chairs signify both my desire to bring people together for the sake of self transformation, as well as being able to more deeply connect them. The column represents the strength that I feel in myself through good times and bad; however, the healing significance of the abdomen image will not be apparent unless you have read many of my Bloom Blog posts. There is so much more I can express about this visual, with plenty more connections to be made as I travel through 2018. Stay tuned for some next steps once your Bloom Board is created. Have fun!